Using a highly experimental portal device, you'll once again face off against a lethally inventive, power-mad A.I. named GLaDOS. And this time you won't be alone. Meet an expanded cast of characters as you think your way through dangerous, never-before-seen areas of Aperture Laboratories. 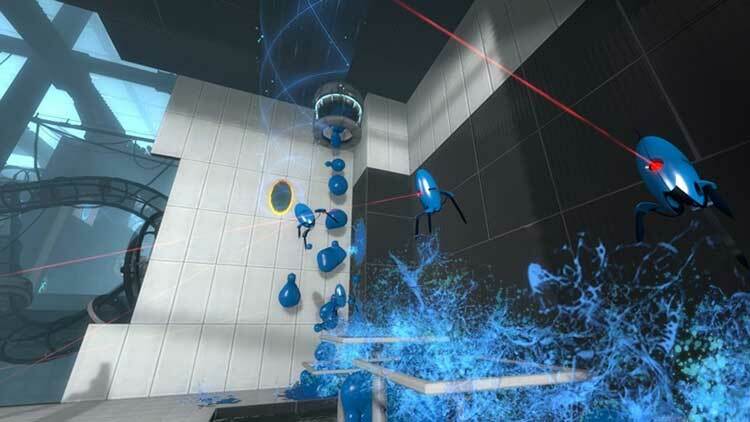 Break the laws of spatial physics in ways you never thought possible, with a wider variety of portal puzzles and an expansive story that spans a single player and co-operative game mode. Retains the style of the original while breaking free of the sterile environments to explore new territory. The scale of the levels is at times jaw dropping. This is the quintessential “bigger and better” sequel that focuses and expands on the original’s strengths while raising the quality bar higher, but without breaking much new ground. But you may be in the wrong hobby if you’re complaining about more Portal. 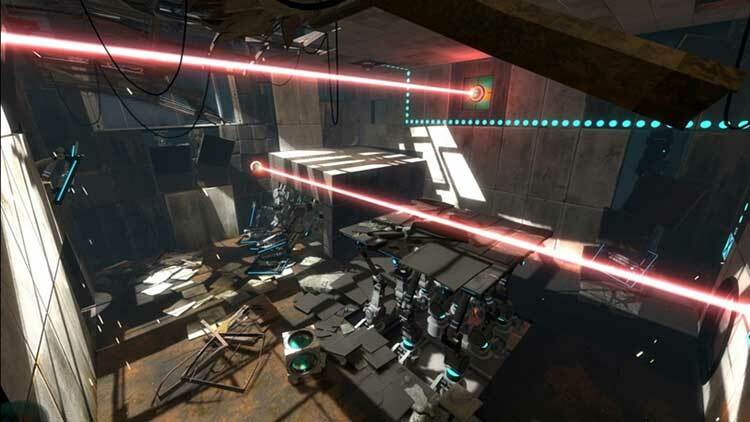 As you journey through the massive Aperture facility, it becomes clear that Portal 2 does not merely come after Portal. Instead, it radiates outward from its predecessor, simultaneously illuminating the world that gave rise to Portal and continuing the adventure that began there. The sense of novelty is diminished, but the thrill of exploration and puzzle-solving is still intoxicating, and it's amazing how Portal 2 manages to tell a better story with disembodied voices and spherical robots than most games can with full-on humans. Between the marvellous story, perfect pacing, evolving/subtle soundtrack, challenging but not frustrating puzzles, and one of the absolute best ending sequences the likes of which may never be seen again, there is literally nothing to complain about this game. And that is only talking about the single player campaign – the social gamers amongst us will be completely satisfied after running through the co-op story with a friend (or even complete stranger!). 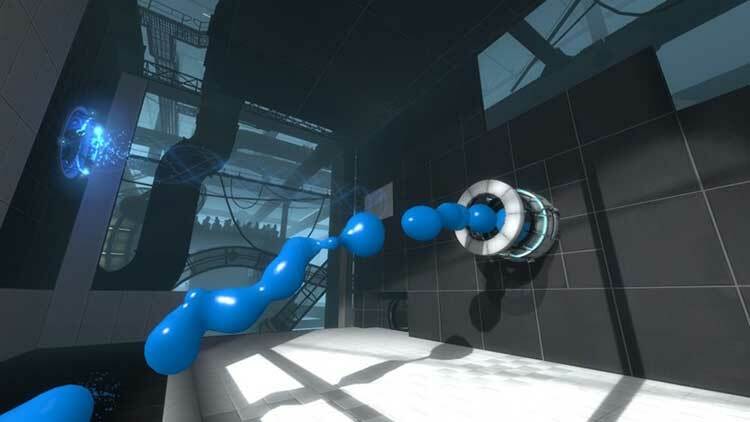 Portal 2 makes the original look like the prototype it was. It's filled with a larger cast of characters vividly brought to life through brilliant writing and some of the best voice acting in video games. Its puzzles are challenging without being unreasonable, and, once you're finished with the single-player mode, one of the best co-operative experiences on the market awaits. Valve cuts no corners and finds ways to make you care about everything from the major characters to the cubes used to solve puzzles. 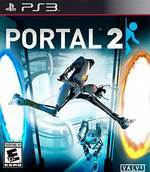 Games like this don’t come around very often, and if you miss out on this one you’ll be skipping one of the finest examples of the medium the industry has to offer: Portal 2 is compelling, exciting, wildly capricious and, most importantly, laugh out loud funny. And who knows, maybe there’ll be a surprise waiting for you – at the end. The first game introduced such great technology with the portal gun and laid down a solid framework from which to gain further inspiration; the sequel simply had to be even better. 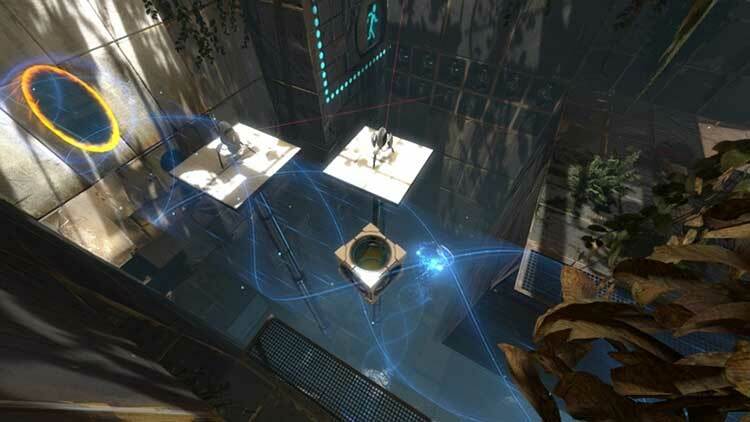 The good news is that Portal 2 doesn’t disappoint; in fact it's exceeded our expectations. 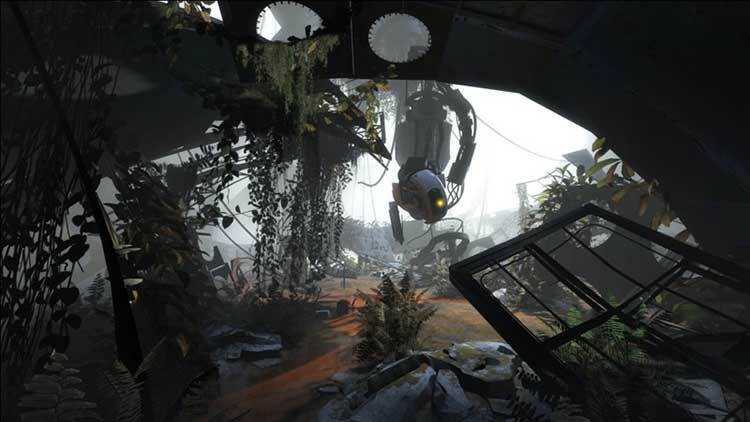 From the captivating storyline and the casting of the brilliant Stephen Merchant as Wheatley, to the sheer volume of puzzles and the ingenuity that has gone into their design, Portal 2 is everything it promised to be and much more. Algunos conceptos como la repetición de determinados puzles y exigencias o pocas opciones en cooperativo no le dejan convertirse en la obra maestra que los más seguidores de Valve no tardarán en ver en él. Pese a esto, es un juego estilizado y absoluto como pocos, un ejemplo más de que la diversión que propone esta industria a veces llega a cotas inimaginables, aternativas a la marea de juegos habitual y aptas para todos los públicos. Émancipation réussie pour la série Portal, qui s'affranchit de son ancienne condition de jeu bonus avec un Portal 2 qui ne révolutionne certes pas la formule mais arrive tout de même à justifier son nouveau statut. 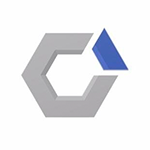 Renforcé par une structure narrative plus développée qu'en 2007 et clairsemé de nouveaux mécanismes de jeu destinés à rafraichir autant que possible son gameplay à base de portails, cette suite s'accompagne en plus d'un mode coopératif plutôt sympathique malgré un manque de challenge généralisé. Exception faite d'un second acte un peu en retrait, Portal 2 impose une aventure d'une saveur incomparable, impeccablement mise en scène et bourrée d'autant d'humour que d'ingéniosité. Les nombreuses nouvelles mécaniques renouvellent les puzzles, la durée de vie excède nos espoirs, le mode Coopératif se déguste en ligne ou en local avec délectation, et même si la fin ne saurait être aussi savoureuse que celle du premier, elle conclut un rollercoaster de sensations pures et de trouvailles de génie qui forcent le respect. Portal 2 é só aquele jogo. Entra de imediato para a estreita margem dos imperdíveis. Um clássico imediato, um propulsor de originalidade e inovação, onde tudo está longe de acabar à lei da bala, mas dentro dos limites da física. Espicaçando a mente humana, revela todos os seus atributos num esquema de puzzles tão satisfatórios e plenos de incertezas como legítimos. É certo que este jogo encerra uma sequência, mas é muito mais engenhoso, rigoroso e admirável. Portal 2 is daarom ook de game waar gamers al sinds de eerste Portal op zitten te wachten. Portal wordt volgens velen al gezien als een perfecte game, maar Portal 2 is gewoon op ieder vlak verbeterd en vernieuwd. Het is meer, het is beter en het is de droom van iedere gamer. Met geweldige humor en boeiende personages sleept de game je mee en laat je niet meer los. Valve bewijst maar weer eens een geweldige ontwikkelaar te zijn en levert met Portal 2 wellicht de beste game af die deze generatie ooit heeft gekend.